Step 1: In a large pitcher, combine lime juice, tequila, and agave syrup. 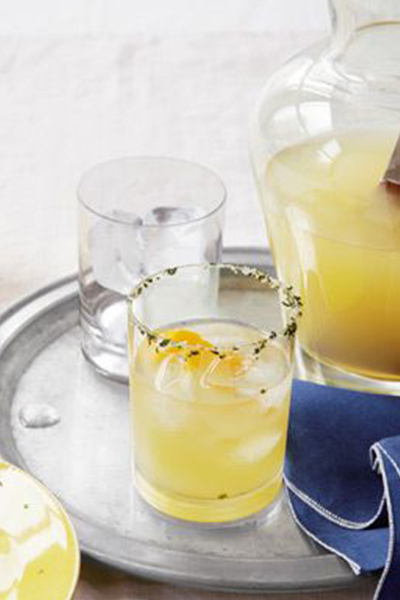 Rub each old-fashioned glass rim with 1 orange zest strip, then place zest in glass. Put 1/4 teaspoon agave in a small bowl, and combine mint and salt on a small plate. Dip your finger in syrup and rub along glass rims. Dip glasses in mint-salt mixture to coat rims. Put 4 ice cubes in each glass. Step 2: Place 5 ice cubes in a cocktail shaker. Pour half the lime-tequila mixture into shaker and shake vigorously. Pour into 3 glasses. Repeat with remaining ice cubes and lime-tequila mixture. Enjoy these margaritas, guilt free, from Country Living!